The largest combined reunion of Civil War veterans ever held occurred at Gettysburg in 1913. The Commonwealth of Pennsylvania hosted the event and extended invitations to every surviving honorably discharged Union and Confederate veteran in the nation. It was scheduled to be a unique encampment, a combined reunion of members of the Grand Army of the Republic and United Confederate Veterans. The response was overwhelming and despite efforts to limit the numbers attending, over 50,000 veterans came to Gettysburg and settled into the great camp situated on the battlefield. Former foes walked together over the old battlefield and re-lived the terrible days where so many of their comrades had lost their lives. 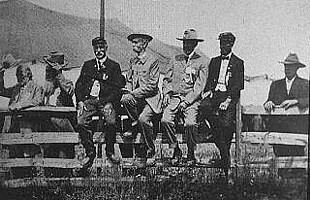 Not only were there veterans of Gettysburg, but men who had fought under McClellan at Antietam, Jackson in the Shenandoah Valley, Sherman in Georgia, Grant in Tennessee, Bragg in Kentucky, Hood at Atlanta, and Ord at Appomattox. This was the largest gathering of former soldiers who had changed the face of a nation, torn it apart, and now delighted in its reunification. (Right) Photograph of old soldiers in blue and gray as they pose side by side for the camera near the Great Tent in 1913. Pennsylvania Governor John K. Tener insisted from the beginning that the state be the sole host of the reunion and provide funds for free rail transportation to all of his state's veterans. The governor urged other states to provide equal donations for their veterans for transportation and sustainment during the encampment. Though his request did not fall on deaf ears, the expense of sending hundreds of old soldiers to the reunion from as far away as California was overwhelming and many states could not provide cash donations either to the reunion or to their veterans. A handful of northern states were successful in passing special legislation to assist their veterans while others depended on personal contributions to help get the old men to Pennsylvania. The Virginia chapter of The United Daughters of the Confederacy took an active role and supplied United Confederate Veterans' uniforms to those in the state who needed them. Other chapters of the UDC held socials and fund raisers to gather money for transportation as well as food, clothing, and medical assistance. Despite Pennsylvania's good intentions for hosting the reunion, Governor Tener was soon faced with a growing financial and political dilemma. The projected cost of the reunion rose as plans changed, and with it grew opposition in the legislature as more state money was appropriated. Several legislators argued that hosting two large veteran organizations without compensation was fruitless and was eventually going to put a strain on the state budget. Tener finally approached the Federal government, which agreed to step in and appropriate funds to feed and provide tents for the veterans during the encampment. Additionally, US Army personnel would support the reunion with cooks and bakers, quartermaster staff and troops to aid in crowd control. Emergency Federal money would also pay the bills for the reunion until the states could appropriate some back payments. With this assurance of aid, the Pennsylvania legislature approved half a million dollars to cover the cost of the reunion. Plans to establish a camp large enough to house the perspective number of guests and military support personnel were started two years before the event. The number of tents required to house everyone would quickly deplete the state's supply and again the Federal government stepped in to provide additional tents and equipment necessary to complete the camp. Personnel from the United States Army Quartermaster Corps and Engineer Corps arrived at Gettysburg National Military Park in 1912 to plan military and civilian support for the encampment. The engineers surveyed the field adjacent to the fields of "Pickett's Charge" where they laid out the arrangement for "The Great Camp", divided into areas for Union veterans and for Confederate veterans. Soldiers installed utility systems, erected hundreds of tents to house the veterans, built picnic tables, benches, and boardwalks throughout the camp. By the first of June the sprawling Great Camp occupied 280 acres, included 47 1/2 miles of avenues and company streets, was lit by 500 electric arc lights, and 32 bubbling ice water fountains were installed. Over 2,000 army cooks and bakers manned 173 field kitchens, ready to provide three hot meals per day for veterans and camp personnel alike. 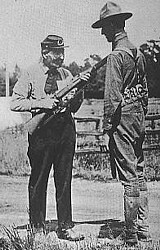 Two battalions of the Fifth United States Infantry guarded the camps and supply depots, and provided security along with a mounted detachment of the Fifteenth United States Cavalry. Pennsylvania also provided medical staff and a detachment of the Pennsylvania State Police and Pennsylvania National Guard to support the reunion activities. Several hundred members of the Boy Scouts of America served as escorts to the veterans during the encampment, acted as aides and messengers in the army hospitals, and acted as couriers for various officials. Medical care was provided by the American Red Cross and US Army Medical Corps. The first veterans arrived on June 25 and within days the Great Camp swelled to overflowing. Every veteran was provided a cot and bedding in a tent that would hold eight men. Meals were served from a kitchen at the end of each company street and varied from fried chicken suppers to pork roast sandwiches with ice cream for desert. By the end of the reunion, the army kitchens had supplied over 688,000 meals to reunion participants. Invariably the days were hot and the thermometer topped 100 degrees on July 2. Heat exhaustion and physical fatigue resulted in hospitalization of several hundred veterans. Over 9,980 patients were treated by medical personnel for ailments ranging from heat exhaustion to stomach disorders. Remarkably, only nine veterans passed away during the week-long encampment. Despite the heat and often dusty conditions, nothing could keep the aged men in camp and hundreds wandered the battlefield. Many visited battle sites where they or their comrades had been fifty years before. Confederate veterans especially were pleased to find old cannon mounted on metal carriages to mark the locations where their batteries had been during that fateful battle. Invariably, the presence of khaki-clad US Army personnel caused a lot of excitement. The soldiers were there to guard camp supplies, give demonstrations, and provide services to the veterans who delighted themselves discussing the modern weapons of war. Many an aged veteran was eager to explain how much things had changed in fifty years to any soldier who was handy and army personnel were entertained by old soldiers at every turn. The youngest veteran at the reunion was 61 years old and the oldest "alleged that he was 112 years." In spite of their advanced years, the old soldiers walked for miles through the battlefield park and packed into the Great Tent erected in the field of "Pickett's Charge" adjacent to the camp, for daily meetings and ceremonies. Every day there were programs with speeches by dignitaries and governors of several states. Though President Woodrow Wilson had made a conscious effort to avoid the event, he was persuaded by an assistant not to let such an opportunity slip by. Following some last minute arrangements, President Wilson came to Gettysburg to address the veterans on July 4th. The president spoke to the veterans with compassion and gratitude: "These venerable men crowding here to this famous field have set us a great example of devotion and utter sacrifice. They were willing to die that the people might live. But their task is done. Their day is turned into evening. They look to us to perfect what they have established. Their work is handed unto us, to be done in another way but not in another spirit. Our day is not over; it is upon us in full tide." A singular highlight of the reunion was the meeting of Pickett's Division Association (Pickett's Division) and the Philadelphia Brigade Association near the High Water Mark on July 3, 1913. Despite the torrid heat, the veterans made speeches, traded ceremonial flags and shook hands over the stonewall that outlines the Angle where fifty years before, the two groups had met in mortal combat. In 1913, the nation and the world were in political turmoil. On the edge of the first World War, European alliances over political and territorial disputes were affecting the world market, national pride and threatened a precarious peace between numerous foreign "democracies" and sovereign states. The Wilson administration was already under pressure for the United States to stay out of European disputes though opponents believed that America should take an active role in world affairs. The age of industrial barons was at its height and their influence in national politics broadened political and social divisions. 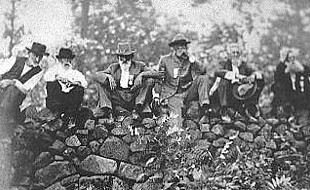 In the center of it all was this Great Reunion at Gettysburg, an event whose significance did not go unnoticed by a public weary of sectional turmoil and political rhetoric. The Washington Post summed up the event: "Nothing could possibly be more impressive or more inspiring to the younger generation than this gathering. They feel the thrill of bygone days, without a knowledge of its bitterness, which, thank God, has passed us all. But even more touching must be the emotions of these time-worn veterans, as they assemble on an occasion that in itself constitutes a greater victory than that of half a century ago, and one too, in which every section of a reunited country has common part." Confederate guests pause in the shade. 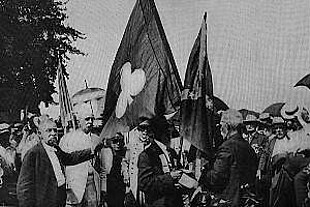 For a while it appeared the Great Reunion was to be the last dual gathering of the United Confederate Veterans and the Grand Army of the Republic. 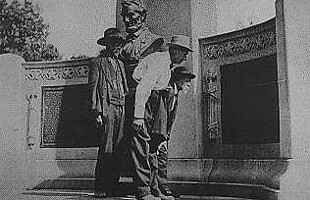 The goodwill expressed at Gettysburg faded as the nation plunged into World War I, raced through the "roaring twenties", and was traumatized by the Great Depression. By the 1930's, a new generation of veterans from the Great War outnumbered the old veterans of the past, largely forgotten in time as their numbers dwindled and more pressing affairs touched American lives. 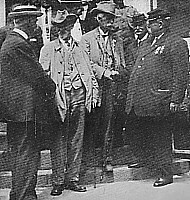 A more radical and less forgiving leadership altered the United Confederate Veterans, and with time the goodwill expressed at the 1913 reunion was just a faint memory. As the 75th anniversary of the battle of Gettysburg approached, it appeared that another reunion at Gettysburg was out of the question. If not for the persistent efforts of Gettysburg native Paul Roy it might never have happened. Roy spent five years in pursuit of the leadership for both organizations and finally convinced them to have one last meeting on the old battleground. Approximately 1,800 veterans from across the country came to Gettysburg for the last great reunion in 1938, yet it was a far cry from the great gathering of old soldiers twenty-five years before. The monuments and memorials have not crumbled to dust as Dr. Cox predicted in 1913. They still stand in silent honor to the men, the regiments, and the armies that fought this great battle. It is the words and deeds of the veterans at that great reunion that have faded with time. All traces of the Great Camp are long gone; the site was returned to farm fields soon after the reunion, and residential and commercial growth during the 1950's has covered the area where the veterans of that great war camped, talked, and ate together. The site where the Great Tent stood is once again returned to the peaceful pursuit of raising corn and wheat. Many of the Gettysburg shops and restaurants visited by the veterans are long gone, replaced by new owners and updated interiors for the modern consumer. Yet if you stand on Seminary Ridge on a quiet summer's evening and listen closely, you may detect the low murmer of aged men shuffling through the dry grass, sharing memories to one another of when they were young, full of bravado, serving their country as soldiers.